As a holistic veterinarian and scientist, Dr. Gary Richter helps dog and cat owners to navigate the thicket of treatment options and separate the fact from the fiction. He wants us to use what actually works, not just what Western science or alternative medicine say should work. This multifaceted approach to health is known as integrative medicine. Dr. Richter examines traditional medicine from many cultures alongside modern medical techniques, describing the best of complementary care and the best of conventional veterinary medicine. Every treatment he recommends has the backing of scientific research or years of successful outcomes in his clinical practice. After explaining the treatment, he offers specific recommendations for an integrative approach to common diseases, including allergies, skin conditions, diabetes, heart disease, and cancer. A holistic approach to health includes nutrition, as it sets up the foundation for your pet's health. 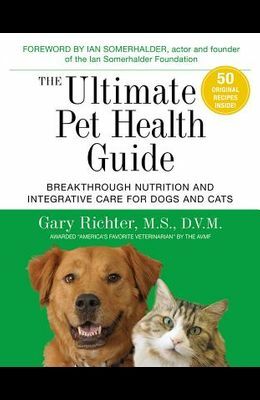 Dr. Richter cuts through the hype in the pet-food world and explains how to choose the best commercial foods and supplements, and even includes both raw and cooked dog- and cat-food recipes for general diet as well as to treat specific needs. He also explains how we can use the right foods and supplements to hack the body's processes, including the immune system.